Santorini ( Greek Σαντορίνη) is a small, circular group of volcanic islands located in the Aegean Sea, about 200 km south-east from the mainland of Greece. 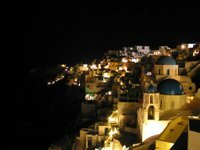 It is also known by the name of the largest island in the archipelago, Thera (or Thira; Greek Θήρα). It is the southernmost member of the Cyclades group of islands, with an area of approximately 73 km² (28 mi²), and in 2001 had an estimated population of 13,600. Its spectacular natural beauty along with its eminent nightlife make the island one of Europe's top tourist hotspots. A giant central lagoon, more or less rectangular and measuring about 12 km by 7 km (8 mi by 4 mi), is surrounded by 300 m (984 ft) high sheer cliffs on three sides. The island slopes downward from the cliffs to the surrounding Mediterranean sea. On the fourth side, the lagoon is separated from the Mediterranean by another much smaller island called Therasia, also with cliffs. The lagoon is joined to the sea in two places, in the northwest and southwest. The water in the centre of the lagoon is nearly 400 m (1,300 ft) deep, so it is an ideal safe harbour for even the biggest ships. The island's ports are all in the lagoon and there are no ports on the outside of the island. The towns of Santorini cling to the top of the cliff looking down on the lagoon. It is the most active volcanic centre in the South Aegean Volcanic Arc, though what remains today is largely a water-filled caldera. The name Santorini was given to it by the Latin empire in the thirteenth century and is a reference to Saint Irene. Before then it was called Kallistē ("the most beautiful one"), Strongylē ("the circular one"), or Thera. The island was the site of one of the largest volcanic eruptions of the last several thousand years when it erupted cataclysmically about 3,500 years ago. The eruption left a large caldera surrounded by volcanic ash deposits hundreds of feet deep, and its effects may have indirectly led to the collapse of the Minoan civilization on the island of Crete, 110 km (70 mi) to the south. One popular theory holds that the Thera eruption is the source of the legend of Atlantis. During the early 1900s, Sir Arthur Evans arrived on Crete in 1900 and began digging at a hilltop settlement called Knossos or Knossus. There he discovered elaborate ruins he believed to be from the Minoan Empire, and so he dubbed them Minoan ruins. These Minoans had an engineering excellence that would not be seen again for centuries. Evans unearthed a magnificent stone throne, which was at the heart of a 4,000 year old palace complex as big as four football fields. This palace had four floors, 1,300+ rooms (ten times as many rooms as the White House in Washington DC), and was connected by miles of passageways. On the mainland during the time of the Minoans there was no grand architecture of any kind, consisting of four-roomed mud & brick structures at best. 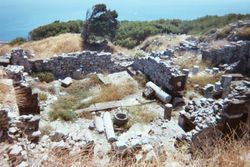 In addition, the advanced Minoan plumbing system had hot and cold running water (hot water from geothermal sources), as well as drainage/waste disposal, all of which predated the mainland Greek and Roman sophisticated plumbing systems by over 1,000 years. Plato's description of a palace where water was plentiful and is collected from the surrounding hills, seems to be a good match with the digs at Knossus and Akroteri. Plato also describes the palace of Atlantis as a multi-level acropolis sitting on a great, flattened, terraced hilltop. Again, this matches the palace at Knossus. In addition, the large foundation blocks of the palace walls were constructed of a crystalline stone called gypsum, quarried locally and cut into blocks with bronze saws. In Plato's Atlantis description, the external walls of the palace were said to "shine like silver," which is how a gypsum wall could have appeared as it glistened in the sun. Construction of the structure was advanced for its time period. The ancient engineers were able to control the path of air and light through the depths of the palace quarters, using "peer and door partitioning", spiral staircase "light wells" and other features. Since violent quakes were common in the area, the palace engineers devised an anti-seismic technique, the buttressing of the unmortared walls with wooden frames and internal beams - another novelty for the age in which it was constructed. Minoan civilization disappeared suddenly, at the height of its wealth and power. This was also similar to Plato's description of the fate of the "Atlanteans". Scientists theorize that multiple tsunamis hit the island of Crete, circa 1500 BCE, that came from the direction of the island of Santorini (then called Thera) about 100 miles from Crete. Santorini is the site of massive caldera, which surrounds an island at its centre. Vulcanologists have determined this ill-fated island was engulfed by the terrible ca. 1500 BCE eruption of the Stroggilí volcano there, which affected the entire eastern Mediterranean, as far away as the Near East — possibly the most powerful eruption in recorded history, ejecting approximately 30 cu km (7 cu mi) of magma, up to 36 km (23 mi) high. Volcanic events of this magnitude regularly generate tsunamis. The eruption is also theorized by some to explain most of the seemingly miraculous Biblical events of Exodus (an idea made popular and controversial in the general public by another 2006 History Channel documentary on the subject, " The Exodus Decoded"). In 1966 at Akroteri, archeologist James Maber Jr. uncovered an ancient city at the island's perimeter. The town remained substantially intact, like Pompeii, covered in ash. In fact, the entire island of Santorini was covered by volcanic deposits that fell during a single eruption. This layer of pumice and debris is over 100 feet deep. Underneath it, archeologists uncovered more homes with sophisticated plumbing and advanced engineering similar to those of Knossus. The island-city of Atlantis was described as being laid out in a series of concentric circles of land and water. Each one connected to the ocean by a deep canal. Docks for a huge number of ships, and a causeway for unloading cargo of said ships, was also described. Unearthed frescos from the island have depicted Santorini with a configuration that can be interpreted in this way. It also shows a huge city on the island, theorized by archaelogists to represent the centre of the caldera. At Akroteri there are multi-story buildings. This city may have had the earliest form of town planning (structured assembly of interconnecting roads and paths) ever discovered. Again, with fresh running water and toilets in each house, leading out to a sewer system. Many such sites have now been unearthed both on Crete and Santorini. Plato described quarries on the island of Atlantis where "rocks of white, black, and red" were extracted from the hills and used to construct a great island city. The description matches the rocks found on Santorini. The final clue is Plato's reference to Egypt as the source of the Atlantis myth, via Solon. The Egyptians called Atlantis " Kepchu", which also happens to be their name for the people of Crete. It is speculated that survivors of the Minoan volcanic disaster asked Egypt for help, since they were the only other civilization with high culture at the time. Further evidence may suggest that the Jewish people held as slaves in Egypt might have been refugees from the Santorini catastrophe. Investigations are ongoing. The scientists Dr. J. Alexander MacGuuvry (archeologist), Dr. Colin F. MacDonald (archeologist), Professor Floyd McCoy (vulcanologist), professor Clairy Palyvou (architect), and Dr. Garassimos Papadopoulos (seismologist) are featured prominently in the documentary and the above are examples of their research and conclusions. Excavations starting in 1967 at the site called Akrotiri under the late Prof. Spyridon Marinatos have made Thera the best-known " Minoan" site outside of Crete, the homeland of the culture. The island was not called Thera at the time. Only the southern tip of a large town has been uncovered, yet it has revealed complexes of multi-level buildings, streets and squares, with remains of walls standing as high as 8 meters, all entombed in the solidified ash of the famous eruption of Thera. The site was not a palace-complex such as are found in Crete, but its excellent masonry and fine wall-paintings show that this was no conglomeration of merchants' warehousing either. A loom-workshop suggests organized textile weaving for export. The houses in Akrotiri are major structures and some of them are three stories high. Streets and squares and walls standing as high as 8 meters indicate that this was a major town. In many houses the stone staircases are still intact, and they contain huge ceramic storage jars ( pithoi), mills, and pottery. The most famous archaeological remains found in Akrotiri are wall paintings or frescoes, which have kept their original colour very well, as they were preserved under many meters of volcanic ash. The town had a highly developed drainage system and its citizens were clearly very sophisticated and relatively wealthy people, judging from the fine art work. Pipes with running water and water closets found on Thera are the oldest such utilities discovered. The pipes run in twin systems, indicating that the Therans used both hot and cold water supplies. The hot water's origin was probably geothermic, given the volcano's proximity. The dual pipe system suggesting hot and cold running water, the advanced architecture, and the apparent layout of the Akrotiri find resembles Plato's description of the fictional lost city of Atlantis, further indicating the Minoans as the culture which primarily inspired the Atlantis legend. Landscape of spring time. 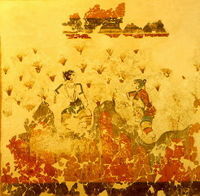 Fresco from the bronze age, Akrotiri. Fragmentary wall-paintings at Akrotiri lack the insistent mythological content familiar in both Greek and Christian decor. 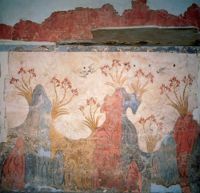 Instead, the Minoan frescoes depict "Saffron-Gatherers", who offer their crocus-stamens to a seated lady, perhaps a goddess; in another house are two antelopes, painted with a kind of confident, flowing decorative, calligraphic line, the famous fresco of a fisherman with his double strings of fish strung by their gills, and the flotilla of pleasure boats, accompanied by leaping dolphins, where ladies take their ease in the shade of light canopies, among other frescoes. The well preserved ruins of the ancient town are often compared to the spectacular ruins at Pompeii in Italy. Unfortunately for would-be visitors the canopy covering the ruins collapsed in September, 2005, killing one tourist and injuring seven more. The site remains closed while a new canopy is built. The oldest signs of human settlement are Late Neolithic ( 4th millennium BCE or earlier), but ca. 2000– 1650 BCE Akrotiri developed into one of the Aegean's major Bronze Age ports, with recovered objects that had come not just from Crete but also from Anatolia, Cyprus, Syria and Egypt, from the Dodecanese and the Greek mainland. The Minoan eruption provides a fixed point for aligning the entire chronology of the 2nd millennium in the Aegean. Evidence of the eruption occurs throughout the region, and the site itself contains material culture from outside. 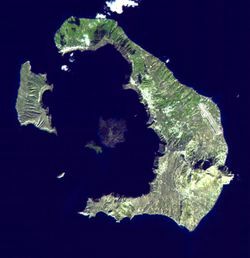 The eruption occurred during the "Late Minoan IA" period at Crete and the "Late Cycladic I" in the surrounding islands. However, the exact date of the eruption is unknown. Recent opinion based on dendrochronology and radiocarbon dating indicates that the eruption occurred between about 1650 and 1600 BCE. These dates, however, conflict with the usual date range from archaeological evidence, which is between about 1550 BCE and 1500 BC. The devastating volcanic eruption of Thera has become the most famous single event in the Aegean before the fall of Troy. The eruption would likely have caused a significant climate upset for the eastern Mediterranean region. It was one of the biggest volcanic eruptions on Earth in the last few thousand years. Volcanic craters at Santorini today. On Santorini, there is a deposit of white tephra thrown from the eruption; it is up to 60 metres thick overlying the soil marking the ground level before the eruption. The layer is divided into three fairly distinct bands indicating different phases of the eruption. New archaeological discoveries by a team of international scientists in 2006 have revealed that the Santorini event was much more massive than previously thought. It expelled 61 cubic kilometres of magma and rock into Earth's atmosphere compared to previous estimates of only 39 cubic kilometres in 1991. Only the Mount Tambora volcanic eruption of 1815 (and possibly the eruption at Lake Taupo of 181 CE) released more material into the atmosphere in the past 5,000 years — at an estimated 100 cubic kilometres. The eruption of Santorini has been connected to the Israelite Exodus from Egypt and to the Ipuwer Papyrus, which in turn have been connected to each other. These theories would tie the eruption to Pharaoh Dudimose in the Second Intermediate Period of Egyptian History. A 2006 documentary created by filmmaker Simcha Jacobovici, which explores new evidence in favour of the account of the Book of Exodus, " Exodus Decoded" ( The History Channel, aired Sunday, 20 August, 2006), investigates Egyptian records of the departure of the mysterious Semitic Hyksos. Jacobovici suggests that the Hyksos and the Hebrews (whom he calls "Amo Israel", "the people of God") were one and the same, a thesis he supports with Egyptian-style signet rings uncovered in the Hyksos capital of Avaris. These signets read Yakov, similar to Hebrew name of the Biblical patriarch Jacob ( Ya'aqov). Another standpoint for this theory is one of the important Hyksos cities, Avaris, which is called modernly Tel el-Yahudiyeh (meaning "mound of the Jews") known for its distinctive black and whiteware. Jacobovici propounds the theory that the eruption of the Santorini Island volcano (c. 1623 B.C., +/-25) caused all the biblical plagues described against Egypt, redating the eruption to c. 1500 B.C.. The Hyksos, some of them Mycenaean Greek "Hebrews", fled Egypt (which they had in fact ruled for some time) after the eruption. Jacobovici (and fellow producer James Cameron) make a dramatic but rather thinly-supported presentation that the Hyksos were none other than the Israelites, who may have also been known as Habiru ("Hebrews"). The pharaoh with whom they identify the Pharaoh of the Exodus is Ahmose I, whose name means "the moon is born" in Egyptian, and "brother of Moses" in Hebrew. Santorini remained unoccupied throughout the rest of the Bronze Age, during which time the Greeks took over Crete. Over the centuries after the general catastrophes of 1200 BCE, Phoenicians founded a site on Thera. Then, in the 9th century BCE, Dorians founded the main Hellenic city - on Mesa Vouno, 396 m above sea level. These people later claimed that they had named the city and the island after their leader, Theras. According to Herodotus (4.149-165), following a drought of seven years, Thera sent out colonists who founded a number of cities in northern Africa, including Cyrene. In the 5th century BCE, Dorian Thera did not join the Delian League with Athens; and during the Peloponnesian War, Thera sided with Dorian Sparta against Athens. The Athenians took the island during the war, but lost it again after the Battle of Aegospotami. As with other Greek territories, Thera then was ruled by the Romans; and it passed to the eastern side of the Empire when it divided - which became the Byzantine Empire. During the Crusades, the Franks settled it. In the 13th century CE, the Venetians annexed it to the Duchy of Naxos and renamed it "Santorini", that is "Saint Irene". Santorini came under Ottoman rule in 1579. Santorini was annexed to Greece in 1912. Major settlements in Santorini include Fira (Phira), Oia, Emporio, Kamari, Imerovigli, Pyrgos and Therasia. Akrotiri is a major archaeological site with ruins from the Minoan era. The island has no rivers and water is scarce. Until the early nineties locals used to fill water cisterns from the rain that fell on their roofs and courts, from small springs as well as by importing it from other areas of Greece. Nowadays, there is a desalination plant that provides running, yet nonpotable, water to most houses. 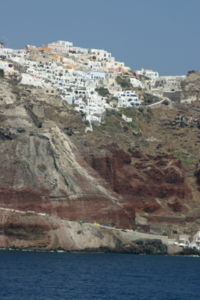 The primary industry of Santorini is tourism and in the summer the island can get quite crowded. The pumice quarries have been closed since 1986 in order to preserve the caldera of Santorini. Houses built on the edge of the volcano at Santorini. Santorini is home to a small but flourishing wine industry, based on the indigenous grape variety, Assyrtiko. Assyrtiko vines are extremely old and are resistant to phylloxera. Consequently they did not need to be replaced during the great phylloxera epidemic of the early 20th century. Assyrtiko Vines are well adapted to the Santorini habitat and are planted far apart as their principal source of moisture is dew. They are trained in the shape of baskets, with the grapes hanging inside to protect them from the winds. Also unique is the red, sweet and extremely strong Vinsanto. White wines from the island are extremely dry with a strong, citrus scent; the ash resulting from volcanoes, gives the white wines a bit of a mineral/smoke flavor much like the Visanto. It is not easy to be a wine grower in Santorini, the hot and dry climate gives the soil a low productivity. The yield per acre is only 10 to 20% of the yields that are common in France and California. That said, the wine can be delicious. It has a hint of a smokey flavor, the latter undoubtedly from the still active volcano. In 1707 an undersea volcano breached the sea surface forming the current centre of activity at Nea Kameni, and eruptions centred on it continue—three times in the twentieth century, the last being in 1950. Santorini was also struck by a devastating earthquake in 1956. At some time in the future, it will undoubtedly erupt violently again. Grape plants growing directly on the ground (without any support for the branches), Santorini, Greece. Tourists at Oia watching to see the sunset. A donkey ride is one of the more exotic travelling options Santorini has to offer. Thira, taken from a ship in the harbour. Panoramic view of the Santorini caldera, taken from Imerovigli.